Kevin Garcia of Santo Domingo Pueblo has begun making hand-turned melon shell heishi of a quality that is seldom seen these days. he also makes hand-turned turquoise beads of the finest quality. We're extremely impressed with the quality of his materials and his painstaking work to make fine handmade beads. 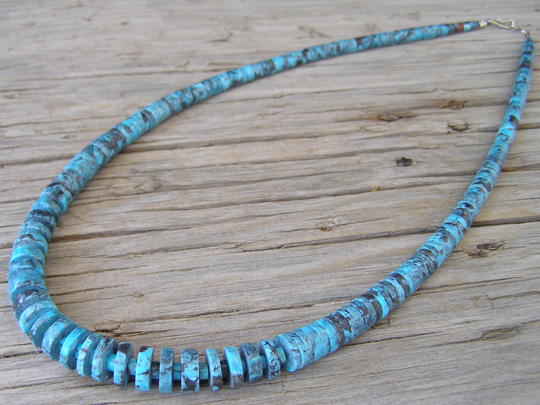 This is a classic Santo Domingo necklace made of hand-turned graduated Kigman turquoise beads. He used spacer beads in teh center of the necklace to assure that it has good round shape with no binding of the beads. This is lovely blue Kingman turquoise with black and gray matrix. A single bead of pipestone near the catch functions as a "spirit bead" symbolizing the imperfection of man's creations.